Adlertag ("Eagle Day")      was the first day of Unternehmen Adlerangriff ("Operation Eagle Attack"), which was the codename of a military operation by Nazi Germany's Luftwaffe (German air force) to destroy the British Royal Air Force (RAF). By June 1940, the Allies had been defeated in Western Europe and Scandinavia. Rather than come to terms with Germany, Britain rejected all overtures for a negotiated peace. 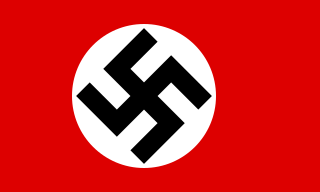 During the Battle of Britain, Hitler gave the German armed forces ( Wehrmacht ) a directive (Directive No. 16) that ordered provisional preparations for invasion of Britain. This operation was codenamed Operation Sea Lion (Unternehmen Seelöwe). Before this could be carried out, air superiority or air supremacy was required. The Luftwaffe was to destroy the RAF in order to prevent it from attacking the invasion fleet or providing protection for the Royal Navy's Home Fleet which might attempt to prevent a landing by sea. On 1 August Hitler gave the Luftwaffe's commander-in-chief, Reichsmarschall (Empire Marshal) Hermann Göring and the Oberkommando der Luftwaffe (High Command of the Air Force) a directive (Directive No. 17) to launch the air assault. Göring had promised Hitler that Adlertag and Adlerangriff would achieve the results required within days, or at worst weeks. It had meant to be the beginning of the end of RAF Fighter Command, but Adlertag and the following operations failed to destroy the RAF, or gain the necessary local air superiority. As a result, Operation Sea Lion was postponed indefinitely. Radar covered the indicated air space. Albert Kesselring commanded Luftflotte 2. Hugo Sperrle, commanded Luftflotte 3. Hugh Dowding, C-in-C Fighter Command. Dornier Do 17s. These aircraft were flown by KG 2 through the Battle of Britain. Messerschmitt Bf 110s of 1./LG 1. The type suffered heavy losses on Adlertag. Junkers Ju 88s. In the mid-afternoon, this aircraft formed the backbone of German bomber formations. Ju 87Bs. The Ju 87s severely damaged RAF Detling. The Germans had maintained the attacks on airfields in south-eastern England which they had started the previous day. On 12 August, most of the Kentish airfields had been attacked; and on 13 August, the Germans concentrated on the second line airfields south of London. The concentration on Detling and Eastchurch was a failure, as both were Coastal Command stations and bore no relation to Fighter Command. The Germans may have reasoned that if bases such as Manston, Hawkinge and Lympne were neutralised through the attacks on 12 August, then Fighter Command may have had to move onto these airfields. In fact, the bombing of 12 August had failed to knock out these strips, and Adlertag had failed to destroy or render Detling or Eastchurch nonoperational. Owing to poor intelligence, weather conditions, and RAF resistance, attacks on other targets had failed or been unsuccessful. ↑ de Zeng writes there is nothing published on KG 3. It was one of the most obscure bomber units, owing to the loss of most of its records at the end of the war. Their work is the most detailed available. 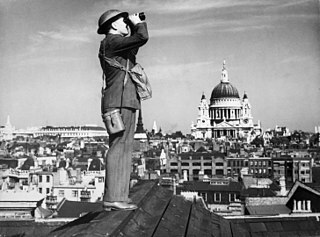 The Battle of Britain was an effort by the German Air Force (Luftwaffe) during the summer and autumn of 1940 to gain air superiority over the Royal Air Force (RAF) of the United Kingdom in preparation for the planned amphibious and airborne forces invasion of Britain by Operation Sea Lion. Neither the German leader Adolf Hitler nor his High Command of the Armed Forces believed it was possible to carry out a successful amphibious assault on Britain until the RAF had been neutralised. Secondary objectives were to destroy aircraft production and ground infrastructure, to attack areas of political significance, and to terrorise the British people into seeking an armistice or surrender. Kampfgeschwader 76 was a Luftwaffe bomber Group during World War II. It was one of the few bomber groups that operated throughout the war. Kampfgeschwader 53 "Legion Condor" was a Luftwaffe bomber wing during World War II. Its units participated on all of the fronts in the European Theatre until it was disbanded in May 1945. It operated three of the major German bomber types: the Dornier Do 17, Heinkel He 111 and the Junkers Ju 88. Kampfgeschwader 2 " Holzhammer " was a Luftwaffe bomber unit during the Second World War. The unit was formed in May 1939. The unit operated the Dornier Do 17 light bomber, Dornier Do 217 and Junkers Ju 188 heavy bombers. During the course of the Second World War KG 2 lost 767 aircraft destroyed and 158 damaged. According to H.L. de Zeng at al, it suffered 1,908 personnel killed in action or missing in action and 214 as prisoners of war. Broken down further, for the duration of the war KG 2 lost 1,228 killed, 688 missing, 656 wounded and with 214 captured, for a total of 2,786 in both combat and non-combat operations. The Hardest Day is a name given to a Second World War air battle fought on 18 August 1940 during the Battle of Britain between the German Luftwaffe and British Royal Air Force (RAF). 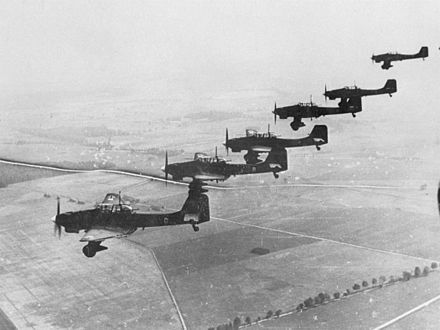 On this day, the Luftwaffe made an all-out effort to destroy RAF Fighter Command. The air battles that took place on this day were amongst the largest aerial engagements in history to that time. Both sides suffered heavy losses. In the air, the British shot down twice as many Luftwaffe aircraft as they lost. However, many RAF aircraft were destroyed on the ground, equalising the total losses of both sides. 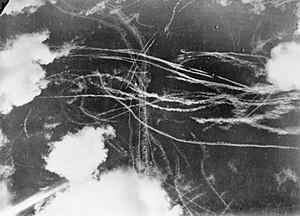 Further large and costly aerial battles took place after 18 August, but both sides lost more aircraft combined on this day than at any other point during the campaign, including 15 September, the Battle of Britain Day, generally considered the climax of the fighting. For this reason, 18 August 1940 became known as "the Hardest Day" in Britain. 1 2 Bungay 2000, p. 207. 1 2 3 4 5 6 7 8 9 10 Bungay 2000, p. 211. 1 2 3 Bungay 2000, p. 371. 1 2 Donnelly 2004, pp. 88–89. 1 2 3 4 Hough and Richards 2007, p. 162. 1 2 3 4 5 6 7 8 9 10 Bungay 2000, p. 210. 1 2 Mackay 2003, p. 71. ↑ Hooton 2007, pp. 47–48, p. 77, p. 86. ↑ Parker 2000, pp. 98–99. ↑ Murray 1983, p. 45. ↑ Hooton 1997, p. 17–18. ↑ Parker 2000, p. 93. ↑ Hooton 2010, p. 75. ↑ Murray 1983, p. 44. ↑ James 2000, p. 17. ↑ James 2000, p. 43. ↑ James 2000, p. 45. ↑ James 2000, pp. 49–62. ↑ James 2000, pp. 63–64, 70. ↑ James 2000, p. 70. ↑ James 2000, p. 71. ↑ Murray 1983, p. 51. ↑ Murray 1983, p. 47. ↑ Bungay 2000, pp. 187–188. ↑ Hooton 1994, pp. 19–20. ↑ Ray 2009, pp. 46–47. ↑ Mason 1969, pp. 236–237. 1 2 de Zeng 2007 Vol 1, p. 14. 1 2 3 4 de Zeng 2007 Vol 2, p. 228. ↑ de Zeng 2007 Vol 2, p. 225. ↑ de Zeng 2007 Vol 2, p. 236. ↑ de Zeng 2007 Vol 1, p. 24. ↑ de Zeng 2007 Vol 1, p. 33. 1 2 de Zeng 2007 Vol 1, p. 48. ↑ de Zeng 2007 Vol 1, p. 171. ↑ Bungay 2000, pp. 203–212. ↑ de Zeng 2007 Vol 1, pp. 49–54. ↑ de Zeng 2007 Vol 1, p. 75. ↑ de Zeng 2007 Vol 1, p. 118. ↑ de Zeng 2007 Vol 1, p. 104. 1 2 de Zeng 2007 Vol 2, p. 360. ↑ de Zeng 2007 Vol 2, p. 266. ↑ de Zeng 2007 Vol 2, p. 370. 1 2 Ward 2004, p. 105. ↑ de Zeng 2007 Vol 2, p. 354. ↑ de Zeng 2010, p. 100. 1 2 3 Goss 2000, p. 79. ↑ de Zeng 2007 Vol 1, p. 155. ↑ de Zeng 2007 Vol 1, p. 146. 1 2 de Zeng 2007 Vol 1, p. 179. 1 2 de Zeng 2007 Vol 1, p. 184. 1 2 3 4 5 Bungay 2000, p. 208. ↑ James 2000, p. 74. ↑ de Zeng 2007 Vol 1, p. 195. ↑ de Zeng 2007 Vol 1, p. 198. ↑ de Zeng 2007 Vol 1, p. 193. ↑ Bungay 2000, pp. 62, 447 Note 23. ↑ Hough and Richards 2007. p. 51. ↑ Parker 2000, p. 117. 1 2 3 Bungay 2000, pp. 61–69. ↑ Parker 2000, p. 123. ↑ Bungay 2000, p. 192. ↑ Collier 1980, p. 51. ↑ James 2000, pp. 71–73. ↑ Bungay 2000, pp. 207–208. ↑ Mason 1969, p. 238. ↑ James 2000, p. 73. ↑ Hough and Richards 2007, p. 157. ↑ Hough and Richards 2007, pp. 155–157. ↑ Goss 2005, p. 60. ↑ de Zeng 2007 Vol 2, p. 232. ↑ Mason 1969, p. 241. ↑ MacKay 2001, p. 31. ↑ Mason 1969, pp. 238–239. ↑ de Zeng 2007 Vol 2, p. 372. ↑ Mackay 2000, p. 51. ↑ Weal 1999, p. 47. ↑ Mason 1969, p. 239. ↑ James 2000, p. 77. ↑ Weal 2000. p. 54. ↑ Korda 2009, p. 167. ↑ Mason 1969, p. 237. ↑ Mason 1969, pp. 239–240. ↑ Warner 2005, p. 258. ↑ Saunders 2013, p. 211. ↑ Saunders 2013, p. 212. ↑ Mason 1969, p. 240. ↑ Dierich 1975, p. 39. ↑ Hall and Quinlan 2000, p. 18. ↑ Baker 1996, p. 113. ↑ Mason 1969, p. 242. 1 2 James 2000, p. 80. ↑ Mason 1969, p. 243. ↑ Goss 2000, p. 80. ↑ James 2000, p. 79. ↑ Bishop 2010, p. 179. ↑ Addison and Crang 2000, p. 58. ↑ Terraine 1985, p. 186. ↑ Murray 1983, p. 54. ↑ Parker 2000, p. 311. ↑ Bungay 2000, pp. 68–69. ↑ Parker 2000, p. 309. ↑ Wood and Dempster 2003, p. 306. ↑ Bungay 2000, p. 379. ↑ Addison and Crang 2000, p. 270. ↑ Bungay 2000, pp. 393–394. Addison, Paul and Jeremy Crang. The Burning Blue: A New History of the Battle of Britain. London: Pimlico. 2000. ISBN 978-0-7126-6475-2.
de Zeng, Henry L., Doug G. Stankey and Eddie J. Creek. Bomber Units of the Luftwaffe 1933–1945: A Reference Source, Volume 1. Hersham, Surrey, UK: Ian Allan Publishing. 2007. ISBN 978-1-85780-279-5.
de Zeng, Henry L., Doug G. Stankey and Eddie J. Creek. Bomber Units of the Luftwaffe 1933–1945: A Reference Source, Volume 2. Hersham, Surrey, UK: Ian Allan Publishing. 2007. ISBN 978-1-903223-87-1. Feist, Uwe. The Fighting Me 109. London: Arms and Armour Press. 1993. ISBN 978-1-85409-209-0. Goss, Chris. Dornier 17: In Focus. Surrey, UK: Red Kite Books. 2005. ISBN 978-0-9546201-4-1. Murray, Willamson. Strategy for Defeat. The Luftwaffe 1935–1945. Princeton, New Jersey: University Press of the Pacific, 1983. ISBN 978-0-89875-797-2. Ward, John. Hitler's Stuka Squadrons: The Ju 87 at war, 1936–1945. London: Eagles of War. 2004. ISBN 978-1-86227-246-0. Weal, John. Messerschmitt Bf 110 Zerstōrer Aces of World War 2. Botley, Oxford UK: Osprey Publishing. 1999. ISBN 978-1-85532-753-5. Wood, Derek and Derek Dempster. The Narrow Margin: The Battle of Britain and the Rise of Air Power. London: Tri-Service Press, third revised edition, 1990. ISBN 978-1-85488-027-7.